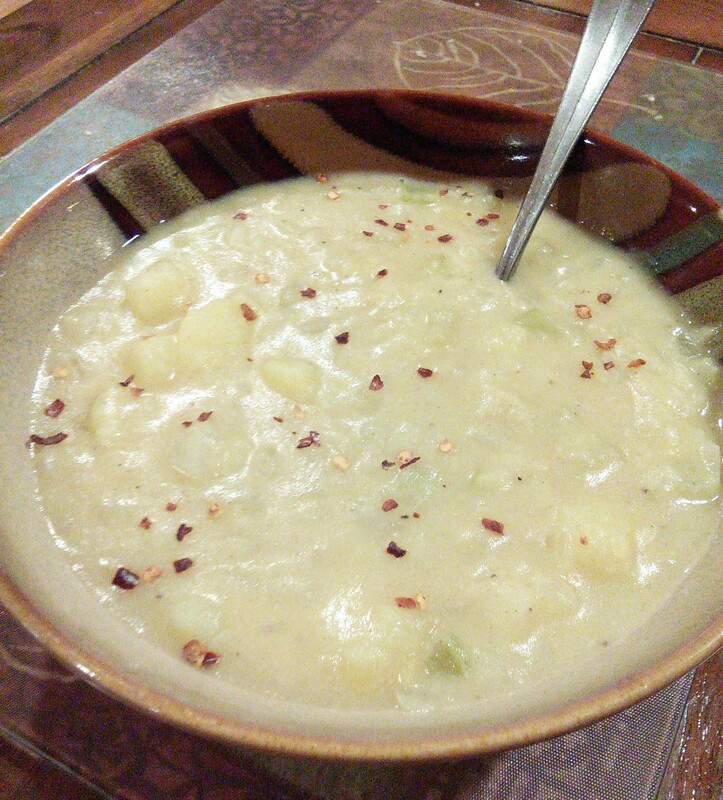 Potato soups are one of my favorites because they’re always flavorful and filling. While I was going through my PlantPure Nation recipe book, I found a “Baked Potato Soup” recipe. How great! Unfortunately, it calls for a high-calorie “Vegan Sour Cream” (a recipe found in the book) and vegan bacon bits. Although the sour cream does follow wfpb-eating, the bacon bits do not. There may be some kind of bacon bits out there which do follow wfpb, but I haven’t seen them yet. I’m not a fan of sour cream or bacon bits on my baked potatoes anyway, so this is a version of the soup without the sour cream and bacon bits. 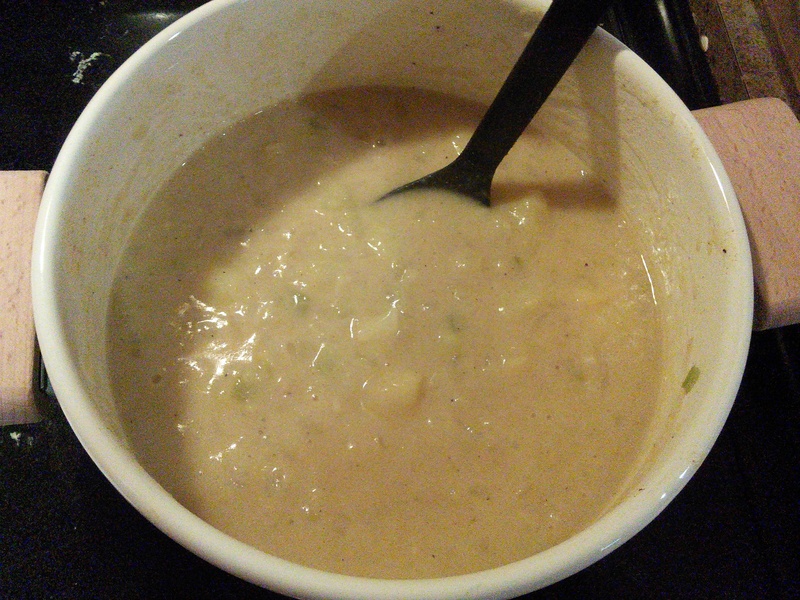 I left out the potatoes in an ingredient-shot of potato soup. Yeah. So pretend you see some yellow potatoes in this picture. Place the potatoes in a large pot and cover with water. Bring to a boil over high heat, then reduce the heat to medium-low, cover, and simmer until just tender roughly 10-15 minutes. Be careful not to overcook the potatoes or they will be mushy (which isn’t a bad thing for a soup but it’s better to leave the potatoes chunkier for this one). 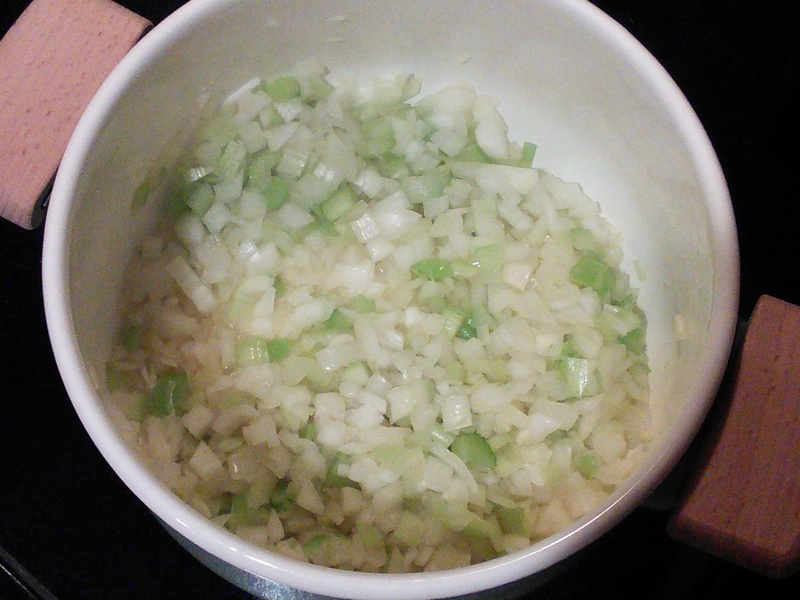 In a laregish saucepot, sauté the celery, onion, and garlic in the ¼ cup vegetable stock/broth until tender. 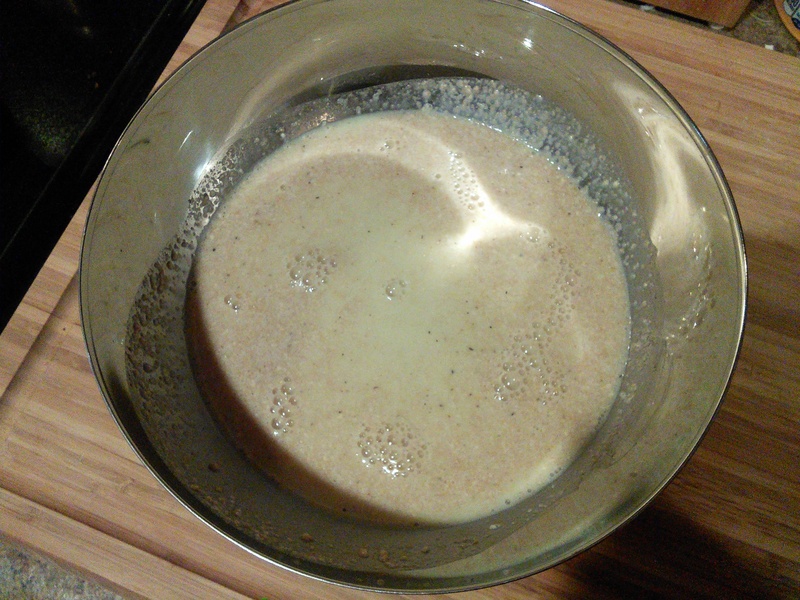 In a separate bowl, whisk together the salt, pepper, flour, nutritional yeast, and milk. Whisk until there are no lumps. Whisk the milk mix into the sautéed vegetables. Keep stirring to prevent sticking and cook for 5 more minutes, or until thickened. You can’t really mess this part up. Just stir to keep it from burning on the bottom and let it cook until it’s however thick you want your soup to be! Drain the water from the potatoes. 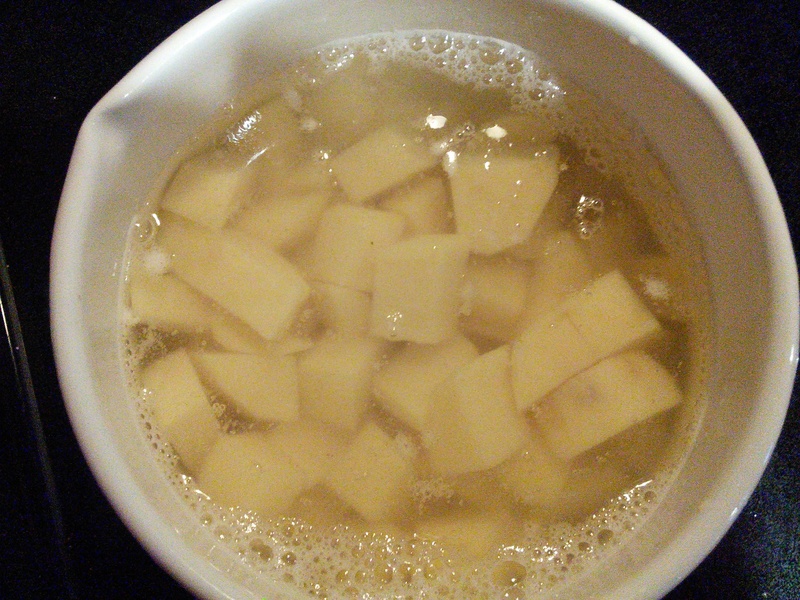 When the milk broth has thickened up, add the potatoes. 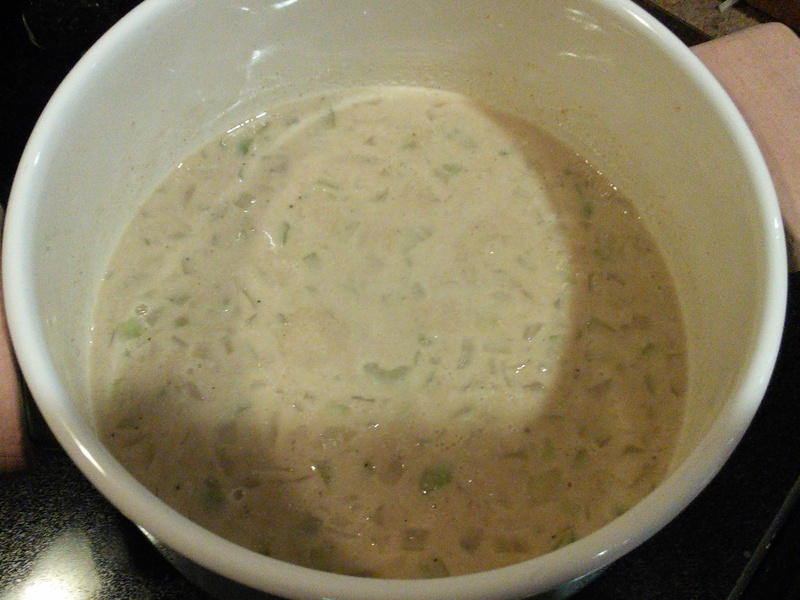 If it’s thickened up more than you like, add a little extra milk to thin it down. Cook until everything is mixed and heated through. Ladle into bowls. Sprinkle red pepper flakes over the top and serve hot! to add flavor – I would A. Saute the onions in the pot your going to make the soup – once dry browned I would add the veggie broth to stop the browning and add the potatoes, boil in the broth. 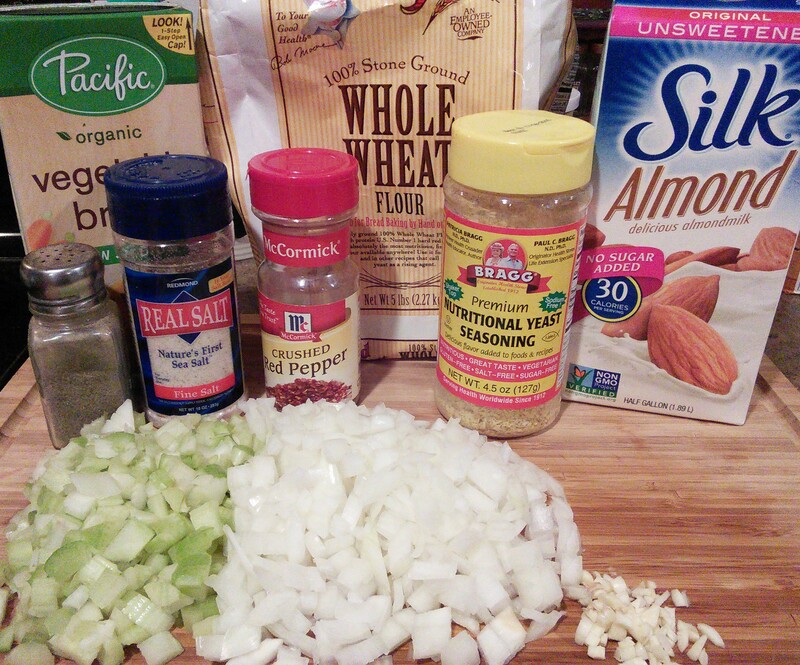 I would roast the garlic – it does change the flavor – more subtle but nicer/sweeter. Then i’d add everthing to the broth and cook until thick once the potato is tender.